YATES cattle (one of the 7 original TL families) were bred during the lifetime of Cap Yates who passed away in the late sixties. Nearly all of the huge Yates herd was dispersed by his family just after his death at Vineyard, Texas in 1968. 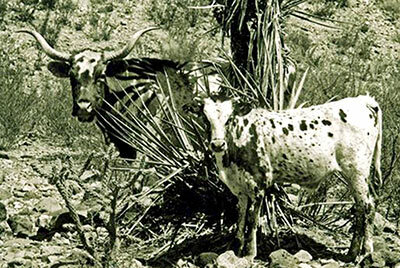 The Yates herd was about 1500 head of rugged cows in the Big Bend area of West Texas, near Alpine. Cap Yates felt that no breed of cattle offered the rancher what Texas Longhorns did in that harsh area of Texas desert. He did, in my opinion, a good job of preventing outside blood from entering his herd. He felt any other blood was inferior to a small Spanish type rugged Longhorn. I never got to meet Cap Yates for which I am sorry. The Yates cows have every quality needed to produce calves in the desert. They are structurally sound and good mothers. They are a true result of survival of the fittest. The old Yates cattle, as a group, weren't impressive. Many were small horned and more solid color than most of the seven families. During the late seventies and early eighties some beautiful colored Yates cattle were bred, which was not a normal thing years ago. Yates cattle lovers have selectively bred for the families with the most color and there were some over 50" horned Yates cows. These are often very twisted as they get old, and some live to be very old. Some Yates cows are very "long headed", "sway backed", and have high tail sets. Of all the seven, they represent the old traditional, coarse, small and rangy type. There were a few truly magnificent Yates cows for horn. These few 50" cows in number probably were one in hundreds among Yates cows. The normal Yates cow had a small circumference and short horn tip to tip around 24" to 34." As to Yates bulls, serious breeders never understood how to mate them. Many Yates bulls were used but I've never seen one with truly long horns. Why aren't there some Yates bulls with over 50" horns like Yates cows? I have no answer for that one. Most of the Yates bulls' horns average under 36" with a very few over that. Some well known Yates bulls possess less than 30" horn tip to tip. The big horn cattle of Yates blood are normally steers, and some are very competitive in shows in their old age. Cap Yates liked the WR cattle and over the years traded bulls with WR several times. Elmer Parker, an employee at WR, felt the Yates blood did a lot to help the WR program. For some reason the federal government felt a oneness with the Yates cattle and welcomed them into the genetics of WR. The WR modern genetics may be as much as half Yates blood. The early YO Ranch Texas Longhorns were also heavy Yates blood. Yates cattle, like Peeler and WR were abundant for those starting herds in the sixties. Pure Yates cattle were in early sales and through out early pedigrees, but today very few people can recall any Yates blood that was of great value. The following two illustrations are of the bull Yates #8 who was about 28" T2T and sired very colorful dark splotchity wine colored cows. The Yates cow photo was at Presidio, Texas at Lely Ranch. She was bred to fit her environment.